Incorporated in 2005 as an independent nonprofit, CGI aims to persuade wealthy businesspeople to pledge money to Clinton Foundation programs. Former World Wildlife Fund president David Sandalow, who served as a senior environmental official in the Clinton administration, chairs the CGI Working Group. The Working Group’s advisory board is composed of such luminaries as Natural Resources Defense Council president Frances Beinecke; President Clinton’s former Environmental Protection Agency administrator Carol Browner; Pew Center on Global Climate Change president Eileen Claussen; Environmental Defense president Fred Krupp; and Sun Microsystems co-founder Vinod Khosla, an ethanol advocate who supported California’s failed Proposition 87, which would have imposed new taxes on that state’s oil producers. Other key CGI working groups are headed by senior fellows at the Center for American Progress who previously worked for the Clinton administration: Clinton economic advisor Gene Sperling chairs the CGI Education Working Group; Clinton National Security Council staffer Gayle Smith chairs the CGI Poverty-Alleviation Working Group; and Thomas Kalil, deputy director of Clinton’s National Economic Council, chairs the CGI Global Health Working Group. At the 2009 Clinton Global Summit, attendees included Barack Obama, Jordan’s Queen Rania Al Abdullah, Hillary Rodham Clinton, Al Gore, Wangari Maathai, and actors Brad Pitt and Matt Damon. A) The Clinton Health Access Initiative (CHAI): Established in 2002 as the Clinton HIV/AIDS Initiative, this program is dedicated to “expanding access to care and treatment for HIV/AIDS, malaria and tuberculosis … in developing countries.” In its earliest months, BHCCF brokered price cuts by generic drug producers of AIDS drugs, organizing a cooperative that enabled more than 70 poor nations to purchase those medicines at discounted rates. The driving force behind this initiative is Ira C. Magaziner, a longtime Bill Clinton ally who engineered Hillary Clinton’s failed attempt at a healthcare overhaul in the early 1990s. The Clinton Foundation has collected many millions of dollars in donations to fund the Clinton Presidential Library. As of 2004, at least 57 separate donors had given $1 million or more. Among these were Hollywood director-producer Steven Spielberg and his actress wife Kate Capshaw; movie producer Stephen Bing; insurance magnate Peter Lewis; and the Soros Foundation, which is the European arm of George Soros’s Open Society Institute. Another notable donor was Denise Rich — ex-wife of Marc Rich, a billionaire fugitive who had fled to Switzerland to avoid prosecution for 51 counts of racketeering, wire fraud, tax fraud, tax evasion, and illegal oil transactions with Iran; Mrs. Rich gave the Clinton Foundation $450,000. “Former President Bill Clinton’s foundation, despite identifying more than 200,000 of its donors in recent weeks, will not say who paid it windfall prices for stock in a struggling Internet firm with links to the Chinese government…. Mrs. Clinton’s office and the foundation have declined to answer questions about a lucrative 2006 stock transaction, details of which were reported by The Washington Times in March 2008. It ran multimillion-dollar deficits for several years, despite vast amounts of money flowing in. And concern was rising inside and outside the organization about Douglas J. Band, a onetime personal assistant to Mr. Clinton who had started a lucrative corporate consulting firm — which Mr. Clinton joined as a paid adviser — while overseeing the Clinton Global Initiative, the foundation’s glitzy annual gathering … that draws hundreds of business leaders and heads of state to New York City where attendees are pushed to make specific philanthropic commitments. Today, big-name companies vie to buy sponsorships at prices of $250,000 and up, money that has helped subsidize the foundation’s annual operating costs. In addition to direct contributions from the Saudi government, the Clinton Foundation had also received between $1 million and $5 million from the pro-Saudi advocacy group, Friends of Saudi Arabia (FSA). Launched in 2005 and supported by the Saudi royal family, this group acts as a kind of public-relations agency, protesting what it views as the U.S. media’s unfair portrayal of the Saudi nation. Prior the release of the 2007 film The Kingdom, for example, FSA executive director Michael Saba wrote a letter to the chairman of Universal Studios expressing his concern “that the movie might present negative stereotypes about the people of Saudi Arabia.” Notably, Saba himself is an anti-Israel zealot and conspiracy theorist. His 1984 book, The Armageddon Network, alleges widespread Israeli espionage at the highest levels of the U.S. government, complete with a Justice Department cover-up. In 2004 he claimed—on the basis of no evidence whatsoever—that Israeli interrogators had played a role in the abuses at Abu Ghraib prison in Iraq in 2003. While all of these donations from foreign sources raise a host of ethical red flags, contributions that were made during Hillary Clinton’s tenure (2009-13) as Secretary of State (SOS) may be even more significant, given the possibility that such funds could be used to buy immediate political influence. During that period, the Clinton Foundation received millions of dollars in donations from seven foreign governments: Australia, Norway, the Dominican Republic, Algeria, Kuwait, Oman, and Qatar (the latter of which spent more than $5.3 million on registered lobbyists while Clinton was SOS). The government of Saudi Arabia suspended its contributions to the Foundation during Mrs. Clinton’s years as SOS, and then resumed its giving after she stepped down in 2013. A Washington Post review of Clinton Foundation data through 2014, found “substantial overlap between the Clinton political machinery and the [F]oundation.” For example, almost half of the major donors who were supporting Ready for Hillary, an organization promoting Mrs. Clinton’s anticipated 2016 presidential run, and nearly half of the bundlers from Hillary’s 2008 campaign, had given $10,000 or more to the Clinton Foundation, either personally or through foundations or businesses which they themselves headed. As of early 2015, for instance, Clinton friend and fundraiser Susie Tompkins Buell had given the Clinton Foundation some $10 million from her eponymous charitable fund. Another leading Clinton supporter, billionaire Haim Saban, had given an estimated $25 million to the Foundation. * Former Democratic National Committee chairman Terry McAuliffe — who served as manager and chief fundraiser of Hillary Clinton’s 2008 presidential campaign — sits on the Clinton Foundation’s board of directors and is one of its leading fundraisers. In 2011, John Podesta, who served as chief of staff in Bill Clinton’s White House, stepped in for several months as the Clinton Foundation’s temporary chief executive. Also in 2011, Chelsea Clinton formally joined the Foundation’s board. In 2014, the Clinton Foundation spent just over $5 million on grants and aid, as compared to: (a) $12.3 million holding “conferences, conventions and meetings”; (b) $6 million on travel expenses; and (c) more than $25 million on employee wages and benefits. Hillary Clinton resigned from the Clinton Foundation’s board when she announced her presidential candidacy in April 2015. One such transaction involved the State Department’s backing of a 2010 free-trade agreement with Colombia that benefited Pacific Rubiales, a Canadian-based petroleum exploration and production company founded by Clinton Foundation donor and board member Frank Giustra. During her presidential campaign just two years earlier, Hillary Clinton had opposed the trade deal because of Colombia’s poor record on workers’ rights. But then Giustra and his company donated millions of dollars to the Clinton Foundation, and by 2010 the State Department under Mrs. Clinton was heaping praise upon Colombia’s human rights record. This allowed Pacific Rubiales, whose operations were centered in Colombia and Peru, to reap huge profits. American political campaigns are prohibited from accepting foreign donations, but charitable foundations based in the U.S. are under no such restriction. Nevertheless, before Hillary Clinton could assume her post as President Barack Obama‘s Secretary of State in 2013, the White House—in an effort avoid the appearance of any conflicts of interest—demanded that she sign a memorandum-of-understanding that not only barred the Clinton Foundation from accepting any foreign government donations while Mrs. Clinton was in the State Department, but also required the Foundation to publicly disclose the identity of all its contributors during that time. The roots of this particular matter go back to 2005, when Clinton Foundation donor and board member Frank Giustra—owner of the Canadian-based uranium mining and development company UrAsia Energy Ltd.—flew aboard his own private jet along with Bill Clinton to Almaty, Kazakhstan, where the pair dined with that nation’s authoritarian president, Nursultan Nazarbayev. In a move that contradicted and undermined American foreign policy and U.S. criticism of Kazakhstan’s poor human-rights record at that time, Mr. Clinton publicly expressed support for Nazarbayev’s bid to head an international elections monitoring group. Nazarbayev was greatly pleased by the propaganda that Clinton issued on his behalf. Clinton’s appearance in Kazakhstan also proved extremely profitable for Frank Giustra. Just days after he and Clinton met with President Nazarbayev, UrAsia Energy Ltd. signed a preliminary deal that gave it stakes in three uranium mines controlled by Kazakhstan’s state-run uranium agency, Kazatomprom. The Kazakhstan mines have long been among the most lucrative in the world. And Giustra’s good fortune, in turn, proved to be beneficial for Bill Clinton as well. Indeed, within a few months Giustra donated $31.3 million to the Clinton Foundation. Fast-forward to 2007, when UrAsia merged with a South African uranium-mining company named Uranium One, which had assets in Africa and Australia. The newly formed entity kept the name Uranium One and was controlled by a number of UrAsia investors. One of those investors was a Canadian named Ian Telfer, who became Uranium One’s chairman. Even after Frank Giustra’s involvement with Uranium One was finished, he maintained his close relationship with the Clinton Foundation. In the spring of 2008, Giustra pledged $100 million to the the Clinton Giustra Sustainable Growth Initiative (CGSGI), a Clinton Foundation project promoting leftist environmental and labor practices in the natural resources industry. To help reach that goal, Giustra on CGSGI’s behalf held a fundraiser that generated $16 million in pledges. Ian Telfer was one of those in attendance at the fundraiser, along with such luminaries as Elton John, Shakira, Tom Cruise, John Travolta, and Robin Williams. By June 2009, Uranium One had fallen on hard times. Its stock value had declined by some 40% in a year. And Moukhtar Dzhakishev, the head of Kazatomprom, had recently been arrested on charges that he had illegally sold uranium deposits to foreign companies, including some of those belonging to Uranium One. Thus, there were questions as to whether Uranium One’s licenses for the Kazakh mines were even valid anymore. Company officials were afraid that they might lose their rights to mine in Kazakhstan. American diplomatic cables that were later made public by WikiLeaks indicated concerns that Dzhakishev’s arrest may actually have been part of a Russian scheme to seize control of the Kazakh uranium assets. Those concerns were later buttressed by documents belonging to Rosatom, the Russian atomic energy agency, indicating that Russia was indeed intent on acquiring a stake in Uranium One, given that Russia’s domestic reserves of uranium were insufficient to meet its own industry needs. On June 10, 2009, Uranium One pressed the American Embassy in Kazakhstan, as well as Canadian diplomats, to provide Kazakh officials with official written confirmation that its mining licenses were still valid. The American Embassy made Secretary of State Hillary Clinton, to whom it ultimately reported, aware of the matter. And on June 10 and 11, the American Embassy’s energy officer met with Kazakh officials to discuss the issue. A year later, in June 2010, the Russian government made an extremely generous offer to Uranium One’s shareholders. If the offer were to be accepted, Russia would have a 51% controlling stake in Uranium One. But because Uranium One now controlled some 20% of all U.S. uranium reserves—and uranium is considered a strategic asset with implications for American national security—the deal with Russia could not be permitted without the approval of the American government. Specifically, that approval could be granted only by the Committee on Foreign Investment in the United States (CFIUS), which is composed of several of the most powerful members of the cabinet—the Attorney General as well as the Secretaries of the Treasury, Defense, Homeland Security, Commerce, Energy, and State. The seven Obama cabinet members who constituted the CFIUS at that time were Attorney General Eric Holder as well as the Secretaries of the Treasury (Timothy Geithner), Defense (Robert Gates), Homeland Security (Janet Napolitano), Commerce (Gary Locke), Energy (Steven Chu), and State (Hillary Clinton). Without the approval of these seven Obama administration officials, Russia’s acquisition of Uranium One could not have taken place. Meanwhile, Bill Clinton and the Clinton Foundation were collecting millions of dollars from people associated with Uranium One. They had begun collecting these millions a few years earlier, and would continue to collect them for at least another two years thereafter. For example, Uranium One chairman Telfer used his Canadian-based family charity, the Fernwood Foundation, to make four donations to the Clinton Foundation totaling $2.35 million. These included donations of $1 million in 2009; $250,000 in 2010; $600,000 in 2011; and $500,000 in 2012. Notwithstanding Hillary Clinton’s aforementioned pledge that all donors to the Clinton Foundation would be publicly identified, these contributions from Telfer were never disclosed by the Clintons. According to Peter Schweizer’s 2015 book, Clinton Cash, at least four members of the Clinton Foundation’s Board of Trustees have either been charged with or convicted of serious crimes, including bribery and fraud. Following is a discussion of each of these four individuals and their transgressions_. (A) The most prominent of the four is former Clinton Foundation board member Vinod Gupta, founder and chairman of the database firm InfoUSA. The U.S. Securities and Exchange Commission alleges that Gupta “improperly used” such things as: “corporate funds for over $3 million of personal jet travel for Gupta and his family and friends to such destinations as South Africa, Italy, and Cancun; $2.8 million of costs associated with Gupta’s yacht; $1.3 million of personal credit card expenses; and costs associated with 28 club memberships, 20 automobiles, his homes around the country, and premiums for three personal life insurance policies.” Further, the Commission charges that Gupta “failed to inform Info’s other board members of the material fact that he had purchased shares of an Info acquisition target for his own benefit from which he obtained realized and unrealized ill-gotten gains.”In addition, Gupta paid Bill Clinton a $3 million “consulting fee,” which constituted an abuse of corporate funds that led to a shareholder lawsuit against Gupta. Eventually the company settled, agreeing to give some $13 million to shareholders. Gupta settled the civil charges without admitting or denying wrongdoing. According to an SEC press release, he agreed to pay $4,045,000 plus prejudgment interest of $1,145,400, along with a $2,240,700 civil money penalty. He was also barred “from serving as an officer or director of a public company,” and restrictions were placed “on Gupta’s voting of his Info common stock.” Another former board member, the wealthy hotelier and Democratic fundraiser Sant Singh Chatwal, is a longtime friend of the Clintons who in 2014 was convicted of illegal campaign financing (including contributions to a Hillary Clinton campaign), obstruction of justice, and witness tampering. As part of his plea bargain, Chatwal agreed to pay the U.S. government $1 million. (C) Still another former board member, the Jordanian-born billionaire Victor Dahdaleh, “was charged by the Serious Fraud Office (SFO) in Great Britain with paying more than 35 million pounds in bribes to executives in Bahrain to win contracts of more than 2 billion pounds,” according to _Clinton Cash. The SFO’s case against Dahdaleh, who worked for the U.S. company Alcoa as a “super-agent,” fell apart when a key witness refused to testify. Alcoa entered a guilty plea in a U.S. case related to the bribery saga and agreed to pay the Department of Justice $384 million. (D) Current Clinton Foundation board member (and energy tycoon) Rolando Gonzalez Bunster has been named in a fraud case in the Dominican Republic involving his power-generation/fuel-distribution company InterEnergy. In 2013, an anti-corruption agency within the Dominican government charged Bunster and others in relation to allegations about “ballooned” fees that they had charged to the government. A few days after the aforementioned interview, Schweizer reported that Stephanopoulos had been “a featured attendee and panel moderator at the annual meeting of the Clinton Global Initiative (CGI)” in 2006; “a featured attendee at the CGI annual meeting” in 2007; a panelist at the CGI annual meeting in 2008; “a panel moderator at CGI’s annual meeting” in 2009; “an official CGI member” in 2010 and 2011; and a CGI contest judge in 2013 and 2014. “Under Clinton’s leadership, [from October 2010 to September 2012] the State Department approved $165 billion worth of commercial arms sales to 20 nations whose governments have given money to the Clinton Foundation…. That figure … represented nearly double the value of American arms sales made to the those countries and approved by the State Department during the same period of President George W. Bush’s second term. “The State Department formally approved these arms sales even as many of the deals enhanced the military power of countries ruled by authoritarian regimes whose human rights abuses had been criticized by the department. Algeria, Saudi Arabia, Kuwait, the United Arab Emirates, Oman and Qatar all donated to the Clinton Foundation and also gained State Department clearance to buy caches of American-made weapons even as the department singled them out for a range of alleged ills, from corruption to restrictions on civil liberties to violent crackdowns against political opponents…. “Under federal law, foreign governments seeking State Department clearance to buy American-made arms are barred from making campaign contributions — a prohibition aimed at preventing foreign interests from using cash to influence national security policy. But nothing prevents them from contributing to a philanthropic foundation controlled by policymakers…. Clintons Hid 1,100 Foreign Donor Names in Violation of Ethics Agreement with Obama Admin. : Clinton Cash revealed five hidden foreign donations. On the heels of the book’s publication, the Washington Post uncovered another 1,100 foreign donor names hidden in the Canada-based Clinton Giustra Enterprise Partnership—a Clinton Foundation initiative Bill Clinton erected with controversial billionaire mining executive Frank Giustra. “A charity affiliated with the Clinton Foundation failed to reveal the identities of its 1,100 donors, creating a broad exception to the foundation’s promise to disclose funding sources as part of an ethics agreement with the Obama administration,” reports the Washington Post. 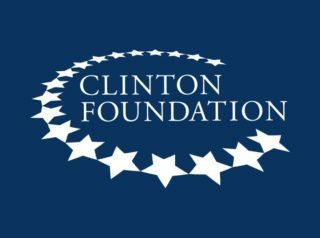 “The number of undisclosed contributors to the charity, the Canada-based Clinton Giustra Enterprise Partnership, signals a larger zone of secrecy around foundation donors than was previously known.” In a follow-up story, the Post reports that only 21 of Frank Giustra and Bill Clinton’s secret 1,100 foreign donors have subsequently been revealed…. Former Clinton Campaign Operative-Turned-ABC News Host George Stephanopoulos Failed to Disclose His $75,000 Donation and Deep Involvement in the Clinton Foundation Before Launching an Attack Interview Against Clinton Cash Author: Clinton political operative-turned-ABC News anchor George Stephanopoulos infamously hid his $75,000 Clinton Foundation donation from ABC News viewers before launching a partisan attack “interview” with Clinton Cash author Peter Schweizer…. In June 2015, the Washington Times reported that the Clinton Foundation had established a fundraising arm in Sweden — known as the William J. Clinton Foundation Insamlingsstiftelse (WJFI) — that had never been disclosed to, or cleared by, State Department ethics officials during Hillary Clinton’s tenure as Secretary of State, even though a Swedish government-sanctioned lottery was one of WJFI’s largest sources of revenue. At a time when the U.S. was ostensibly trying to apply economic pressure to force the government of Iran to terminate its nuclear-weapons program, career officials at the U.S. Embassy in Stockholm observed that Sweden was strengthening its economic ties with Tehran — thereby undermining the American effort. For example, U.S. intelligence officials noted that the Swedish telecommunications giant Ericsson AB was pitching cellphone tracking technology to Iran, for use by the latter’s government security services. Notwithstanding such developments, (a) the Clinton State Department elected not to blacklist any Swedish firms, and (b) WJFI collected some $26 million in donations from Swedish sources. When the Times published its June 2015 report, a WJFI spokesman told the paper that the Swedish entity was heavily involved in fighting climate change and disease in various places around the world. But the Clinton Foundation declined repeated requests from the Times to identify the names of the specific donors that had given money through its Swedish arm. A spokesman for Mrs. Clinton’s 2016 presidential campaign likewise declined comment. In May 2015, Wall Street analyst and longtime financial adviser Charles Ortel reported having found—after 15 months of digging into the Clinton Foundation’s public records, tax filings, and donor disclosures—that the contribution disclosures from the Foundation did not match up with individual donors’ records. He also stated that the Foundation was not in compliance with a number of state laws regarding fundraising registration, disclosure requirements, and auditing rules. “This is a charity fraud,” said Ortel. “Starting almost 20 years ago in 1997,” he added, “the Clinton Foundation spread its activities from Little Rock, Arkansas, to all U.S. states and to numerous foreign countries without taking legally required steps to function and solicit as a duly constituted public charity. I decided it would be fun to cross-check what their donors thought they did when they donated to the Clinton Foundation, and that’s when I got really irritated. There are massive discrepancies between what some of the major donors say they gave to the Clinton Foundation to do, and what the Clinton Foundation said they got from the donors and what they did with it.” For comprehensive details of Ortel’s findings, click here. To view Guccifer2.0’s entire dossier on Hillary Clinton, click here. The Clinton Giustra Enterprise Partnership (CGEP) — founded by the Canadian philanthropist and mining financier Frank Giustra — is a Vancouver-based charity that serves as the Clinton Foundation’s Canadian affiliate. In 2014, CGEP devoted $737,441 — 78% of its expenditures — to management and administration costs for things like office expenses, salaries, and professional and consulting fees. That same year, the organization gave $205,419 — 22% of its expenditures — to charitable programs. In 2013, the figures were similar: 72% was devoted to management and administration costs, and 28% was given to charitable programs. When asked to explain these facts, CGEP issued a statement saying “[i]t is incorrect to look at one-year expenditures in a vacuum,” and claiming that the aggregate numbers for the period from 2010-14 were more significant, because the charity’s work involved projects whose funding was spread out over several years.